Concept of Scaffolded Reading Experience (SRE) Strategy. The Scaffolded Reading Experience (SRE) Strategy has been developed and refined over the past 10 years. According to Graves. M. F and Graves B. B (2003: 1) A Scaffolded Reading Experience (SRE) Strategy is a sets of pre-reading, during-reading, and post-reading activities. The specifically designed to assist a particular group of students in successfully reading, understanding, learning from, and enjoying a particular selection. The Scaffolded Reading Experience (SRE) Strategy is not a preset or largely preset plan for dealing with a text. According to Graves. M. F. and Liang. L. A. (2005 : 387-400) stated the framework has two parts. The Planning Phase takes into account the students who are doing the reading, the text they are reading, and the purposes for reading. Because different combinations of students, texts, and purposes call for very different activities, Scaffolded Reading Experience (SRE) Strategy take a wide variety of forms and no two are exactly alike. In each of these components serves a different purpose: prereading activities prepare students to read an upcoming selection; during-reading activities support and guide students as they are reading; postreading activities provide opportunities for students to synthesize and to organize information gleaned from the text so they can understand and recall important points. Boling, C. J. & Evans, W. H. (2008: 59-66). SRE is an organizational framework that secondary teachers may use to integrate the reading process into their content. A Scaffolded Reading Experience (SRE) Strategy targets two instructional elements: techniques and strategies. Techniques are actions the teacher takes to ensure appropriate prereading, reading, and postreading instruction. Strategies are tools that students use to comprehend information. Liang. L. A. (2011: 3) in this research stated that the Scaffolded Reading Experience (SRE) Strategy is a form of reading instruction that has proven effective previous studies for assisting students in reading, comprehending, and learning from individual texts. Based on the statement above we have a simply conclude that the Scaffolded Reading Experience (SRE) Strategy is flexible way to assist the students in comprehending individual texts, Scaffolded Reading Experience (SRE) Strategy set in two phases, the first is planning phase consist of the student, reading selection and purpose (s) of the study or takes into consideration the particular group of students doing the reading, the text they are reading, and their purpose or purposes for reading it. The second phase, the implementation phase, provides a set of pr-reading, during reading, and post-reading options for those particular readers, the selection being read, and the purposes of the reading. 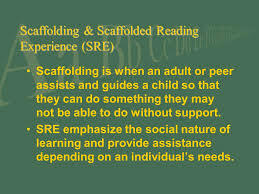 Belum ada tanggapan untuk "Scaffolded Reading Experience (SRE) Strategy in Reading"